Amude-Hashalom is a non-profit organization that operates entirely for the spiritual and physical benefit of the Jewish people with a special emphasis in assisting the weaker sectors of society. Amude-Hashalom is headed by Rabbi Moshe Yazdi, who has started many non-profit initiatives in Israel to assist our fellow Jews. 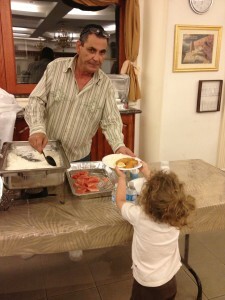 Among the actions carried out by Amude-Hashalom Israel are: Operating 2 soup kitchens that are open daily, distribution of food to the needy, the distribution of clothing, marriage assistance fund, a weekly Torah newsletter in 3 languages (Hebrew, English and French) and more. Rabbi Moshe Yazdi maintains close ties with the Los Angeles community and on one of his visits he observed that many families are experiencing financial hardship. Thus an innovative new project was set in motion on August 26, 2013. The first kosher soup kitchen in Los Angeles was opened at “Tiferet Teiman” Synagogue at 8589 Pico Blvd. The kitchen that is Glatt-Kosher, feeds needy low-income Jewish individuals and families who are experiencing financial hardship. The soup kitchen is open weekly Monday thru Thursday (closed on Jewish and secular holidays) from64 to 7:30 pm, and provides an opportunity for Jewish families, to have a hot and nourishing meal. The delicious, nutritious and home-styled meals are fresh-made daily. The first few weeks have proven to be a great success with many families stopping by the soup kitchen with or without their children. Much praise had been given by both children and mothers regarding the freshness of the products, the quality of the food and the diversity of the meals.Visiting the soup kitchen is a very touching experience and one cannot resist the immediate desire to take a part in this amazing chesed project by donating, volunteering and encouraging other people to participate in helping these wonderful families, in order for the soup kitchen to grow and expand, to feed many more. We invite you to join us and take part in this incredible and much needed undertaking. We can really use your support. The soup kitchen and the non-profit organization are both 100% operated by volunteers. We are currently looking for volunteers and financial backing to support our growing operation and reach out to those who need it most. Come visit or contact us to find out how you can help!